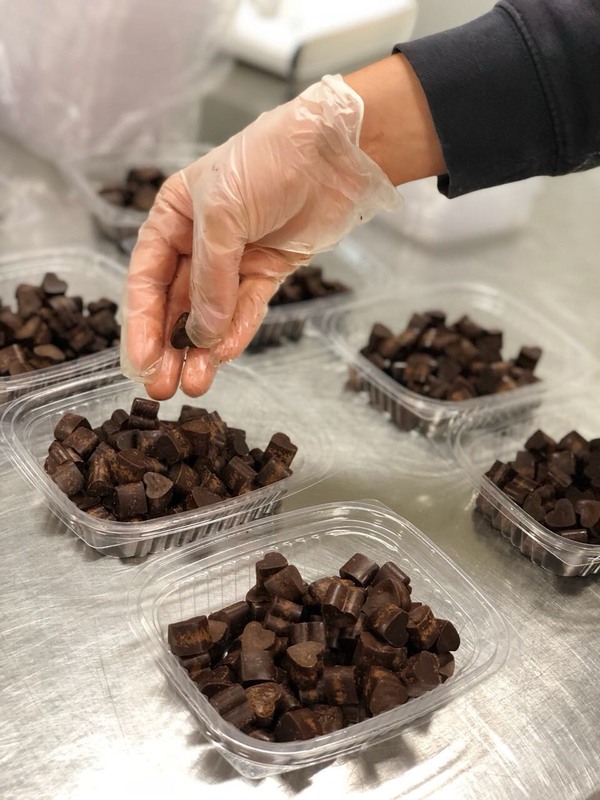 Julie Beyer of GLOW Chocolate creates delicious and incredibly beautiful organic, vegan, dairy-free, soy-free, sugar-free and refined sugar-free, whole-food chocolates and truffles. Handcrafted using carob or raw chocolate, these super satisfying treats also incorporate a wonderful array of herbs and spices and they are sweetened with organic stevia and lucuma, and sometimes a little maple syrup. And they are made right here in Vancouver! Lucky us! We’re also very lucky to have her answer our Meet the Maker Mini Interview questions this month. It’s always so lovely to learn more about the wonderful humans we get to work with. Share your story with us in a 150 words or less. GLOW is my life's work - my soul's calling. Food is my art. I am inspired by the rich natural flavours of real whole food ingredients. I am in love with bringing together the science of nutrition with beautiful flavour synergies to create exceptionally delicious and nutritious recipes. My 'Chocolate Story', isn't your average story of how someone got into chocolate, or became an entrepreneur, or started their own food business. What I can generally say, is chocolate (and carob!) found me. The plants I work with and my experience as an entrepreneur are very much a part of a very personal journey of healing and personal growth. All my chocolates and truffles are a co-creation with something bigger than me; they are created from intuition. I have zero training as a chocolatier, chef or anything related. I consider myself more of an entrepreneur, artist and alchemist. Most importantly, I aspire to provide you with a really good excuse to enjoy chocolate everyday and feel good about it! Getting from an idea to a small business is a lot of work! When did it first sink in for you that ‘this is really happening’? The moment I met someone at a social event who started telling me about this really good sugar free chocolate she had just tried and realized it was GLOW! Out of all your products, which is your personal favourite and why? I enjoy chocolate almost everyday! One of my favourite parts about having my own chocolate business is always having unlimited healthy chocolate at my disposal that I can feel good about. My favourite creations are my Dark Chocolate Crunch, Chilli Cinnamon, Matcha Latte and Lemon Pistachio Saffron GLOW Chocolate hearts; and my Mint GLOWBall Truffles. I personally love unique and uncommon flavour pairings. My best selling flavours are our Smoked Salted Caramel GLOW Chocolate Hearts, Pumpkin Spice Latte and Caramel Almond Crunch GLOBall Truffles. I do love everything I make! I have a 'rule' where I only put something out for sale if I absolutely love the flavour. Being able to be creative and sharing my love of food with people. And knowing that what I create brings so much joy to people - especially those with so many dietary restrictions (auto-immune, diabetic, candida, keto diets etc) who often can't have chocolate, sweets and desserts, yet who can enjoy GLOW. What’s your favourite thing about the town or city you live in? I love that we are so close to the ocean, beautiful forests and that there are so many options everywhere for healthy food. Vancouver makes it easy to live a healthy lifestyle, which I absolutely love! Describe your ideal Sunday morning, including your breakfast. Sleeping in. Yoga. A really good matcha latte (made with fresh almond mylk, dates, REAL vanilla bean powder and good quality matcha) with either a GLOW Chocolate, or a croissant, or gluten-free/ healthy-ish pastry or gluten free waffles with fresh berries, coconut cream, hemp seeds, maple syrup - all enjoyed with a close friend! What are your personal top three tips for feeling awesome? 1. Looking for the positive aspects/ things I appreciate in my experience everyday.